How do I export my customer list from Quickbooks Desktop to Excel? Pull your customer list over to Housecall Pro to get your account ready for use. 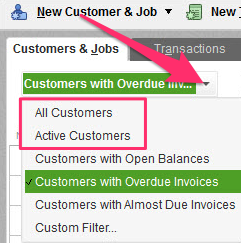 Open Quickbooks Desktop and go to the Customer Center. Click the 'Customers & Jobs' tab. Click the arrow next to 'All Customers' to choose which list of customers you would like to pull over. Remember, you only want to bring over the customer information that you'll use, to keep your Housecall Pro account clean and clutter free! When the correct list is selected, the customers in the list will display in the left vertical pane. You can now export this list to Excel. You'll be taken to the 'Export' window. 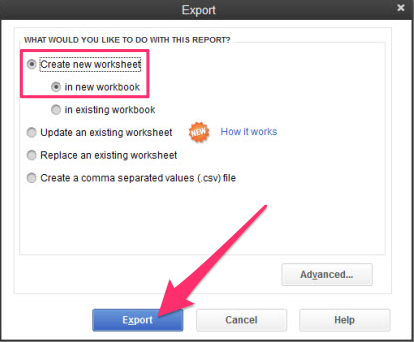 Be sure to choose 'Create new worksheet' and 'in new workbook.' Then click 'Export' at the bottom of the window. You can then import the file into your Housecall Pro account directly or email it to us to be formatted, at datahelp@housecallpro.com. For more tips and tricks for the exporting process, click here.